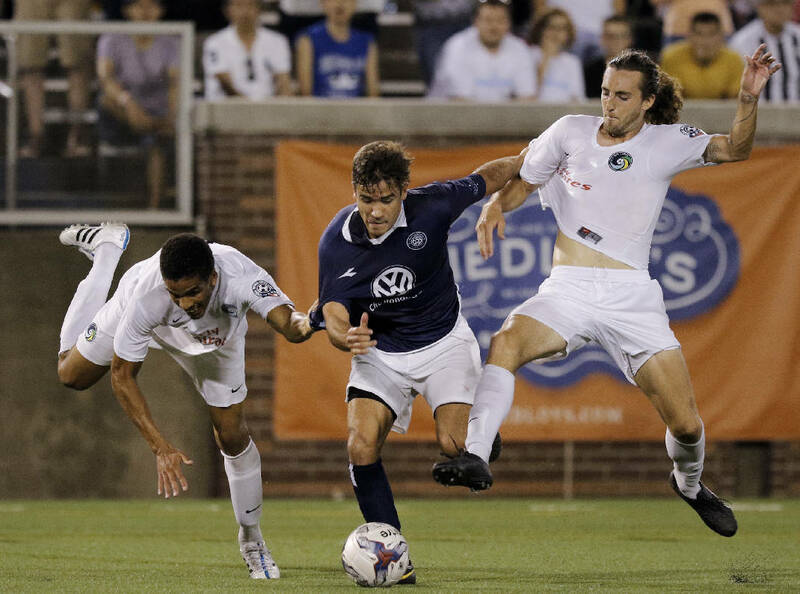 CFC's Luis Trude, center, gets caught between Cosmos players Travis Pittman, right, and Daniel Evuy during Chattanooga FC's NPSL national championship match against the New York Cosmos at Finley Stadium on Saturday, Aug. 8, 2015, in Chattanooga, Tenn. Throughout the course of the 2015 season, the Chattanooga Football Club had been able to conjure up the right combination, the right blend, the right play at the right time on its way to the National Premier Soccer League championship match. Saturday night, the team had the crowd and the opportunity to claim that elusive title. But the New York Cosmos B had other ideas. The visitors broke open a 1-all tie after regulation with two goals in the first 15-minute overtime period and held on to defeat Chattanooga FC 3-2 in front of 18,227 fans at Finley Stadium. The attendance figure set a national record for an amateur soccer match. It was CFC's fourth runner-up finish in the club's history, joining second-place finishes in 2010, 2012 and 2014. Ibrahim Diaby scored two goals for the Cosmos (15-0-1). His first came in the 44th minute, as he tapped in a rebound off a Hagop Chirishian free kick that glanced off the crossbar. That lead held up until the 68th minute, when CFC's Juan Hernandez — who had just been subbed in — received a ball in the box and attempted a shot. It was deflected, but Chris Ochieng was there with the solid follow that tied the match at a goal apiece. It was Ochieng's 13th goal of the year, as he finished as the team leader. The match went to overtime, and 30 seconds in, Diaby scored his second goal on a laser shot from about 25 yards out. The Cosmos then built on their lead in the final minutes of the first overtime, as Julian Stahler scored off a nice feed from Uwem Etuk. CFC (17-3-1) started to attack with more people in the final 15 minutes and create some chances. There was a cross that Nic Edgington got a head on, but the ball glanced off the side post. Moments later, the home team was able to cut the lead in half on a shot by Samuel Goni. "When that final overtime started, the thought was to play for one more," midfielder Luis Trude said. "We just needed one more goal to put pressure on them; then when that goal came, we felt we had it. We knew we were going to score again. The crowd was giving us energy they were so loud. We had a couple more chances, but their goalkeeper did a great job." CFC continued to fight, and in the match's final moments, Goni had another attempt that goalkeeper Kyle Zobeck ranged to his left and got a hand on. "I thought we did a great job coming through when it mattered the most," Cosmos coach Alecko Eskandarian said. "Give credit to the guys; they're a great group. I lost my voice this match, I think I pulled a hamstring, you name it — I think I went through every emotion tonight, but I love these guys and I'm blessed to work with a great group." CFC coach Bill Elliott said the main message he left with his players was not to "cry because you lost, but to smile because it happened. "You always think about the little things after a match like this, but I'm not sure we could have done much more," Elliott said. "They're a fantastic team, the most storied franchise in the history of United States soccer, and it took an unbelievable save to keep the match from PKs. "I thought we left everything out there, but we came up a bit short. I'm incredibly blessed to be a part of it."